- WWE has a new poll asking fans who they want to see win the WWE Cruiserweight Title tournament now that we're headed into the quarter-finals. As of this writing, 26% voted for Cedric Alexander while 18% voted for Kalisto, 17% for Roderick Strong, 12% for Buddy Murphy, 10% for TJP, 7% for Mustafa Ali, 6% for Drew Gulak and 4% for Mark Andrews. Over the last few years, WWE NXT has become a destination for independent talent looking to hone their craft — Kassius Ohno, Samoa Joe, Apollo and The Undisputed ERA are among those whose body of work led them to make the leap to Full Sail University. At least one "homegrown talent," however, isn't impressed with the influx. 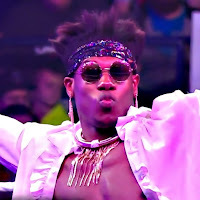 Inarguably one of the Yellow Brand's fastest-rising stars, The Velveteen Dream took to social media to say how he really feels about the "indy guys" who, in his mind, detract from the real Superstars that are worthy of the spotlight. Dream, who loves to speak in riddles, did not, of course, name the competitor(s) who has so ruffled his boa feathers as to rile him up online. (Tyler Bate seems a solid bet, given their recent animosity.) But given the quality of Dream's in-ring performances thus far, it's fair to say that his words are as worthy of the NXT locker room's attention as his actions.